Beginning right after Thanksgiving, every corner of Kansas is lit up... well, like a Christmas tree! WaKeeney, "Christmas City of the High Plains." • WaKeeney, Kansas (pop. 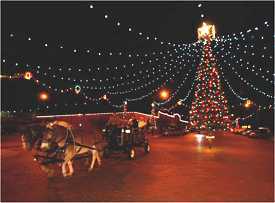 2,000) has held the title of “Christmas City of the High Plains” since 1950. Today, WaKeeney remains a beacon of holiday cheer out on the lone prairie with a 4-block long light display, carriage rides, and visits with Santa from the Saturday following Thanksgiving until after New Year’s. • Often named the No. 1 Christmas lighting displays in all of Kansas, Illuminations at the Botanica Wichita features over a million lights that create a winter wonderland of more than 30 themed holiday gardens. Keep an eye out for tree chandeliers along with animated musical light displays. • A sea of ugly Christmas sweaters worn by Kansas Jayhawk fans broke a Guinness world record for the “Largest gathering of people wearing holiday sweaters" at the KU v. Montana game on December 19, 2015. With 3,473 people participating, KU fans more than doubled the old record set the year before at Loughborough University in the UK. Christmas in Topeka - Topeka's big holiday blowout with a full list of holiday events including dates, times and related map and travel information. Great Bend Trail of Lights - The city's aglow with light shows on Main Street, Veterans Park, and at the zoo, including a full schedule of this year's holiday events. Christmas Tree Farms in Kansas - Where to find choose-and-cut Christmas tree farms statewide. Christmas in Kansas - Stories & interviews illustrate how the holiday season was celebrated back in the day, including a look at a frontier Kansas Christmas from the Kansas State Historical Society.